The "Too Country Tailgate" and Penn State tosu game are upon us!!! If you haven't RSVP'd to the evite - please be sure to give one of the "planners" a call - they'll let you know what you can bring and we can plan for you! We're in the midst of preparing a splendiferous spread - including chili, nacho bar, corn bread, chili cups, kielbasa, blueberry cheesecake bars, pecan pie bars, tex-mex spiced brownies, baked potato dip, cowboy potatoes, stuffin muffins, sausage tortellini soup, fried food a-go-go and so, so, so much more. ALSO we will again be collecting Toys for Tots donations for the Centre County Toys for Tots! 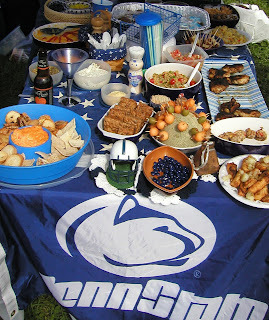 Penn State Tailgating - PENN STATE v tosu; Go West! In just 2 short weeks Penn State will welcome terrelle pryor and the ohio state buckeyes to our little slice of hillbilly heaven. In honor of this we'll be hosting a "Too Country" western themed tailgate. Check out the details on evite and/or check back here for more information - I'll be posting something as soon as I figure out these here internets. We're planning to have another Toys for Tots pledge drive at this tailgate (weather and organizational skills permitting). Food for Thought; ESPN commentary on the state of tailgating. The assault on tailgating. You can take my ticket, but you can't take away my tailgate! Stranger, in a Strange Land; Penn State Homecoming, 2009. As you've all heard by now - Penn State's 2009 Homecoming festivities and game were memorable, to say the least. The weekend started with very discouraging weather forecasts coming from all of the major weather outlets - from Accuweather to the National Weather Service, it appeared that State College (and the surrounding areas) were going to be hit with a noreaster storm - just in time for Homecoming and the Lions' game against minnesota. We had planned for the weather - we prepared "bad weather friendly" food and packed up our gear. The snow started Thursday evening and by Friday morning we found out that many areas of State College were without power and that roads, schools and hotels were closed due to the snow, down trees and power lines. Around 12pm Friday we heard the news that Penn State was going to close the parking lots - the grass parking lots. I was actually scared - I didn't know what to think or do - this was uncharted territory. Calls to the ticket office and internet searches provided little comfort or information - at that point no one knew what was going on. But we decided to head out - and made the trek to State College - we had rain most of the trip - but once past 7 mountains the weather, and the color of the landscape changed dramatically - it was snowing. As we drove into, and around, State College, I thought - this isn't too bad - the roads are fine and there's not even that much snow - I thought that until we got to Park Forest - trees were down everywhere - it looked like a tornado had hit - there were snapped power lines, strewn across the streets - blocking traffic. Stop laughing - we knew very well that it was homecoming weekend - but with no power and the ubiquitous cracking of 50' oak trees, we had to try. I grabbed the local phone book and we headed over to Wegmans - where we sat in the cafe for 2 hours calling every hotel in the book (and on the internet) - and we finally got a room in Lamar - 35 minutes north east of State College. Believe it or not - once we left the State College area, there was no snow. We were safe, and warm, and in a very nice Hampton Inn suite - but our odyssey had just begun. Saturday morning we woke around the time we would have if on a "normal" Saturday - but, the normalcy ended there. We had no idea what awaited us in State College, if we would go to the game that night or even where we were going to stay that night. We considered just staying in Lamar - but we decided that we would make the trip back to State College and see what happened. Around 8am I called the Penn Stater - the nice guy at reservations had suggested that I "call back tomorrow morning" to see if they had any rooms for Saturday. The nice lady at reservations said, "um, no, but I can take your name and number and get back to you if something opens up." So we hit the road - and headed south - toward the snow(ing). It was a particularly odd storm - it seemed to lull over Happy Valley and, in particular, Park Forest. During the course of the weekend, "Park Forest" became the epicenter of the weather world - or at least The Weather Channel. They set up a "location" (with their tent, trucks and GIGANTIC dish) on Douglas Drive in front of an oak tree, that had snapped in half- each hour (as we found out in Lamar) they would "check in" for an update on the situation. As you now know, Penn State set up a "snow emergency" parking and shuttle plan - game goers were encouraged to park their cars at one of the (many) local businesses that offered up their parking lots, and then ride Penn State provided shuttle buses into the stadium. Otherwise, the paved parking lots and portions of the purple lot would be open for reserved parking patrons - until 11am - when the lots would then be open to the public. It was 11am, on a football Saturday - and we were not at the stadium, we were not warming up our lovingly made rib roast for hot roast beef sandwiches - we were walking through the aisles of the grocery store - trying to convince ourselves that it would be "okay" if we missed this one game, and watched it on TV. This was uncharted territory - strange enough to consider watching a home game on TV, but while in State College? It was the Penn Stater - a room had become available - did we want it? After the initial shock - we booked the room and took a few minutes to re-orient ourselves. We were going to the game! We made it over to the hotel and ended up having a small "in house" tailgate - wonderfully delicious food and drink. It was fun - not something I'd want to do every week, but this week, I was quite happy to be warm, dry and watching college football before the game. The hotel had a shuttle to the stadium - we, eventually, made our way to the game to watch Penn State duke it out with Minnesota. It was an amazing weekend - unique beyond compare - as it should be. It's that special time of year; Penn State at michigan. The Lions are traveling out to ann arbor this weekend to face off against the michigan wolverines. Kick off is at 3:30pm (EST), and the game will be televised on ABC (ESPN). Check out GoPSUsports.com for game notes and other information. btw, did you notice this? Okay minnesota - you lose your balloon-boy dome and now you think it's okay to bring your crazy lake-effect weather to Central Pennsylvania? in October? Fine. We'll all be fine. And, barring some really serious travel problems or university edicts, we'll all still be tailgating. Please use all of your cold and rainy tailgating tricks to stay warm and dry - and safe. Homecoming Pep Rally Relocated; Penn State v minnesota. The pep rally following the parade on Friday (which is a go - no matter what the weather) has, per the homecoming committee, been relocated to the Hub. The Homecoming 2009 PEP RALLY location has been moved to ALUMNI HALL in the HUB. The Pep Rally will start directly after the Parade and there will be free food!! I'm Coming Home; Blue White Roundtable - Penn State v minnesota. How does Penn State stop the Minnesota offense (a/k/a Eric Decker)? Pressure on the quarterback will be key. If they can't get the ball to Decker, then he can't catch it (hopefully) - of course the kid has a passing TD under his belt and a qb rating of 244 - so maybe he can. minne has scored at least 20 points in all of their games this season - and PSU has been burned by passing games much less proficient - the front line is going to have to be dominant and the linebackers are going to have to step up their coverage in the middle. The gophers have a good kicker - he hasn't really be tested with a lot of long kicks - but he's been very accurate in the mid-range (feel free to continue your distaste for golden gopher kickers). If they get into the redzone - they'll probably come away with (at least) 3 pts. Is Minnesota's defense as awful as their statistical rankings make it look? minne's losses have been (relatively) close matches - and their d has created/made scores. But they gave up 21 pts (as the result of 3 long drives) to wiscy in the 2nd half of that loss - and Cal ran all over them in their other loss. We'll have to see how Penn State comes out against this team - they've looked "better" since the 2nd half of the (non-directional) illinois game - hopefully it continues. Mid-point of the season, which of the PSU freshmen do you project as future stars? Sean Stanley, DT, has shown great promise; Devon Smith is a cute little sprite - and very quick; and of course, I have high hopes for our Mr. Newsome. Where were you when Minnesota got lucky because Penn State did not put them away at Homecoming '99? In the stands, cursing Joe for punting on the 35. But I was in a car, listening to the game on the radio and driving downtown to go the Phyrst the year that Penn State stole the game away from the gophers - that was a great day. Will Minnesota open with an on-side kick? You know, that play just infuriates me - I hope they do and I hope that Penn State covers and returns the ball into the endzone. That's what I hope. What is your best homecoming memory (that you can say in this forum at least :p)? I have a lot of great memories from homecoming. My best memory while in school was walking in the Parade - the theme of our group's float was "Dr. Seuss" and my character was the little girl (Sally) from The Cat in the Hat - I was so excited to actually be in the parade. My best memory out of school was last year's award winning tailgate. Honorable mentions: The "four time NCAA champion" adventure; Egyptian theme float with Asp madhatter; and, beating tosu 63-14. It's Penn State Homecoming Week! and the Lions are ready (I hope) to do battle with the ever pesky golden gophers of minnesota. On Friday, the Homecoming Parade begins at 6pm - followed by the pep rally and King/Queen coronation on Old Main Lawn. Kickoff on Saturday is at 3:30pm (EST) - the game will be televised on ABC (regionally, ESPN everywhere else). Check out PSU's homecoming site for more Homecoming events! Blue White Roundtable - Penn State vs eastern illinois. Oooh, thanks to WFY for putting together some questions for this week's Roundtable. Most folks are blah about this week's matchup against eastern illinois - me? I can't wait! 1 - Penn State played its most complete game of the season thus far against Illinois. What pleased you the most about the performance? By complete, I assume that you mean "balanced" (ie run/pass - offense/defense) - because the offense did not look good in the first half - not good at all. All that said, the thing that pleased me the most about the game was the improvement in the offensive line. Certainly, the illinois defense wasn't/isn't the toughest squad - but it was as if something "clicked" with the team - and the scoreboard reflected it. 2 - Has your outlook on the season changed dramatically compared to this time last week? What about before the Iowa game? It's still pretty much the same for me. I hope that Penn State gets to a bowl game and I hope that they win the rest of their games. However, after iowa, I just didn't see how it was possible that Penn State would be able to compete with their Big Ten opponents - and through much of the (aforementioned) first half of the illinois game, nothing was changing my skepticism. However, the team really played well in the second half of that game - It was a joy to watch - which was pretty much the first time I felt that way this season. 3 - Eastern Illinois actually looks like a decent I-AA err FCS team, having been in that division's top 25 this season. How long can they stay in it with Penn State? Ack. PSU has to "show up" for this game - I'm hopeful that PSU gains an early lead and that certain players are able to rest/nurse their injuries - but I am sure that the panthers are going to be ready - and I think that eiu will be pesky for the first half. Will the scoreboard be fixed by Saturday? Some panels blew off in the wind on Wednesday. Anybody having luck selling their Eastern Illinois tickets at face value? I know people who did - Me, I'll be at the game. What is your favorite college football blog that isn't about Penn State? hmmm. I'd have had an easy answer a few years ago. Ah heck, I can't think of anyone else. Our Sports State is the best Sports State; P'burgh and Philly Top Sports Towns. And State College is in the top 50! JORDAN NORWOOD IS AN EAGLE!!! ; Bleed Green interview with Jordan Norwood. Bleed Green has interviewed one of the Eagles' newest practice squad members, our own Jordan Norwood! GO STATE BEAT THE PANTHERS! Penn State vs. Eastern Illinois. Okay, so maybe it's not those Panthers. There is a lot of bellyaching across the internets regarding PSU's opponent this week - and yes, I am 100% against the scheduling of FCS teams, but - Tim Curley chose not to give me a call when settling the schedule for '09, so there's not too much I (we) can do about it now. One should never underestimate any opponent - especially one that starts a former iowa hawkeye at quarterback - however, I am hopeful that PSU is able to use this week to heal some of the injuries that the players have amassed in the early part of the season - and that they have a chance to further "jell" as a team. The Eastern Illinois Panthers wear uniforms of blue and gray - so do your best to wear blue and white. Kick off is at 12:00pm - so the parking lots will open at 7am. The game will be televised on ESPN Classics. The current forecast is "windy and partly sunny - high of 60F" - great - wind, my favorite. Thanks to Penn State Clips' Trader Kevin for putting together this week's Roundup.